My little munchkin is totally into putting stuff in her mouth these days. She likes to feel different textures with her tongue. Whatever is small enough to get into her mouth also suffer hearty chomps between her gums. I bought this chain of rings intending to use them to hook up toys to her stroller. It was only when I got home that I realised they also double up as a teether. This is currently her No. 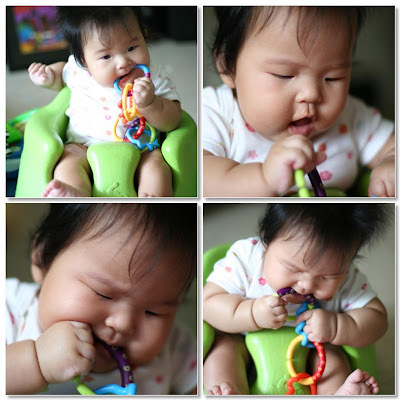 1 favourite toy/teether. Dangle it in front of her and she will, with great intensity, reach out to grab it with both hands and shove it into her mouth. She also often holds it close to her when she sleeps! i have the exact same thing and T loves it! that last photo of her holding on to the links in her sleep is so cute! Noey used to love tose links better than his real toys too. Cheap and good! love the last pix too! 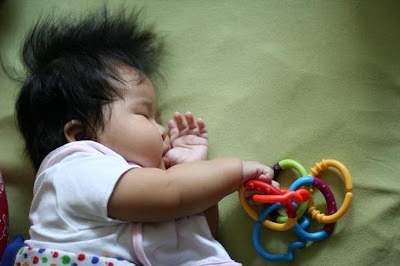 clutching those rings even in sleep! cuteness. I really love watching her sleep. Especially at night, when she sleeps the most soundly. Indeed! She seems intrigued when she uses both hands to pull it in opposite directions. Yah! I tried to take it from her before she slept but she refused to let go so I just let her sleep with it. She has done it again since then. She's already chewing on everything! So I really have to watch her. Caught her 'eating' tissues recently.